This is mostly a reminder note to myself, but I thought I’d post it publicly. So, remember the experiment I’m conducting? I’ve been testing out various components of it while I wait for ethics board approval, and some interesting questions have come up. Some of these questions have already been raised in other posts (and in comment threads – thanks for the discussion, all! ), but I want to summarize them here. When participants are working on the assignments, they will be given full access to the Internet. I had a bunch of conversations with undergrad instructors here at UofT, and across the board, during programming exercises, students have full access to the Internet. They’re prohibited from just copying and pasting code from somewhere else into their assignments, but they can certainly look at online documentation and examples to get some ideas. So I’m going to allow this as well, in order to better model an actual undergraduate assignment. I’m also considering writing a script that will take a screen capture every 30 seconds or so in the background. This way, I can quickly get a sense of the participants activity during the assignments. This should hopefully give me some idea of how much time they’re spending in the browser, and how much time they’re spending writing Python. 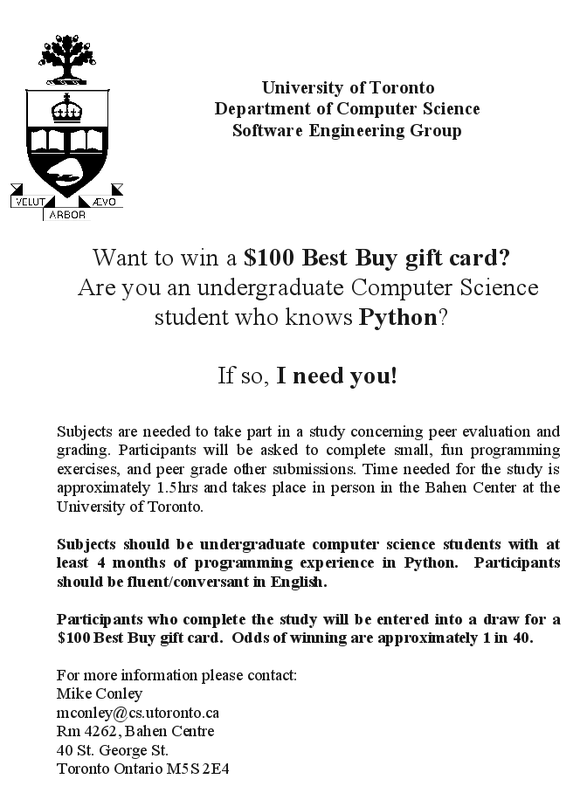 The only prerequisite for my participants is that they must have 4+ months of Python programming experience. I’m not filtering out the stronger or weaker programmers. I’m taking them all. Why? Because I think this will give me a more accurate model of the composition of a first or second year programming course. From my experience, students in first and second year programming courses have a wide spectrum of strengths and abilities. But what if they don’t complete any of my assignments? What if they stare blankly at the screen, or give up, or just surf Reddit because they can’t understand what I’m asking from them? That’s OK – completion of the assignments is not necessary, and again – this relaxation helps to better model a real programming course (because there are invariably students who don’t start, or don’t finish a programming assignment). And it’s OK if they don’t do well. I’m taking a reading of their programming abilities with the first assignment, getting them to do peer grading, and then taking a reading with a second assignment. I don’t care what absolute grades they get, I care about what happens after they’ve done the grading. I might also see some interesting trends – for example, participants who perform poorly on the first assignment might benefit greatly from the peer grading, whereas participants who perform strongly on the first assignment might see little benefit. Or vice-versa. Or neither. Granted, I probably won’t be able to collect enough participants to make such statements with statistical strength, but if a signal appears to be there, it’d be an interesting direction for future work. Students will have 30 minutes maximum to complete each assignment. And that’s absolute – it includes reading the assignment, surfing the Internet, and coding it up. This is because a hard time limit like this, again, better models the state of classrooms as they are. In an open-book exam, you’re not timed on how long you’re spent only writing, with the clock paused as you glance at your textbook. You have a firm time limit, and that’s it. In an ideal world, students would be given a more personal level of teaching, as opposed to this mechanical, factory-floor approach. But if I (or anybody) is ever going to implement these ideas into a real classroom setting, I’ll want to make sure it can be easily adapted into the teaching environment as it already is. This entry was posted in Research and tagged notes, research on April 30, 2010 by Mike. I’ve done it again: I’ve let dust gather on my blog. I’ve finished my courses for this semester, and have gone into full-blown research mode. While my paperwork is reviewed, I’m refining my procedure and apparatus. Better and better. I’ve been accepted into Google Summer of Code this year – I’ll be working on Review Board. Details about my project will be the subject of an upcoming post, which I will toss up shortly. I may or may not be co-directing a radio play. I’ll let you know. The MarkUs team is about to release version 0.7, and a fresh batch of Summer students will soon be here at UofT to work on it! I have not forgotten about the UCDP trip to Poland. I still have to tell you what we saw and did at Auschwitz. Cripes – it’s almost a year since I returned, and I’m only half-way through the whole story. And there’s a ton more to tell. Coming soon. This entry was posted in Code Reviews, Computer Science, Musings, Poland, Research, Review Board, UCDP and tagged auschwitz, code review, courses, ethics, google summer of code, gsoc, MarkUs, Poland, radio play, research, Review Board, still alive, UCDP on April 27, 2010 by Mike.